When people think of sailing, they mostly think they need water and a boat, but what if you could sail on land? Blokarting, is an extreme sport created by combining hand gliding and land sailing, but what’s the difference between land sailing and blokarting? Two words… hand steering. It all comes down to the fact that you can control the movement by steering your pod with the help of the wind. The creation of this yatch dates back to 1999, when the New Zealander Paul Beckett, saw a fun, fast and compact toy, which would offer adventure to people of all ages, gender and even those with disability. Now imagine you are placed into a small compact unit and it has two wheels in the back and one in the front. When you enter this small “cart or pod”, a seatbelt is placed around you and instructions are given. It sounds simple, you pull a rope to go faster, if you let it go your speed will decrease, and most importantly if you feel you’re going to tip over place your hands on the steering. Then you just sit back, grab the rope, place your hands on the steering and get ready to be blown away. Just make sure you’re not going against the wind. There were times when one of my tires lifted, and my first thought was move towards the lifted tire and let go of the rope to maintain balance. It´s not easy at first, but once you get the hang of it, you´re able to enjoy the ride and feel the adventure, especially in every turn you take. Having begun in New Zealand, Blokarting has managed to make its way to South Africa, Australia and will soon be available in the hidden and forgotten Island of Naos at Causeway, Amador. Don’t miss this opportunity, check out Panama Landsailng Adventures for more information or contact us for reservations. 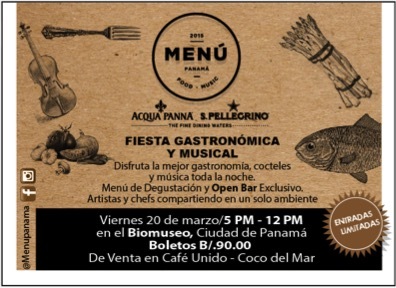 Este sábado 20 de Marzo, 2015- el Biomuseo presenta “Menú Panamá” un encuentro gastronómico para los amantes del buen comer. Con la comida de fonda como tema, reconocidos chefs locales como Chombolín (Íntimo, que se estará inaugurando próximamente), María de los Ángeles (Humo BBQ), Alberto Perrino (Azafrán), Enrique Hendricks (Oink House) y José Olmedo (Donde José) estarán versionando platos tradicionales de fonda. Además participarán chefs internacionales que forman parte de la conocida lista de la versión Latino América de “The World’s 50 Best” : la chef Kamila Seidler, del restaurante Gustu (Bolivia), Gonzalo Aramburu, del restaurante Aramburu (Argentina) y José Antonio González, de Al Mercat (Costa Rica). El evento tendrá lugar en el Museo de la Biodiversidad – BIOMUSEO, ubicado en el Causeway a partir de las 5:00 pm y los participantes podrán degustar 5 platos, además de open bar, y actuaciones musicales. Un espacio en el que podrá compartir con los chefs y artista. No se lo pierda! !